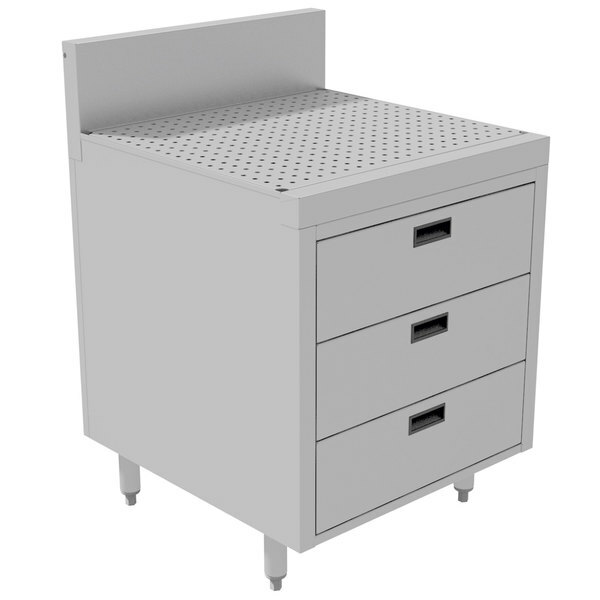 Advance Tabco PR-30-3DWR Prestige Series Enclosed Stainless Steel Cabinet with Drainboard and 3 Drawers - 24" x 30"
This Advance Tabco PR-30-3DWR Prestige series enclosed stainless steel cabinet is part of a complete lineup of upscale underbar equipment. Items found within the Prestige series of underbar equipment line up perfectly with each other, creating a uniform look across any bar. In addition to a number of eye-catching features, this item boasts an exclusive twist-action leg assembly for added strength and an extended 7" backsplash to create a truly one-of-a-kind unit. Ideal for draining and storing glassware and other frequently used bar items, this unit comes with a removable perforated drainboard top and a 1" IPS drain that allow fast draining of wet items. Plus, this unit features (3) 6" deep storage drawers to hold all of the items that you need to store close at hand and a rear deck for additional storage on top. The enclosed 20 gauge, 300 series stainless steel cabinet protects the contents from cross-contamination while the 1 5/8" diameter legs with adjustable plastic bullet feet provide steady support.